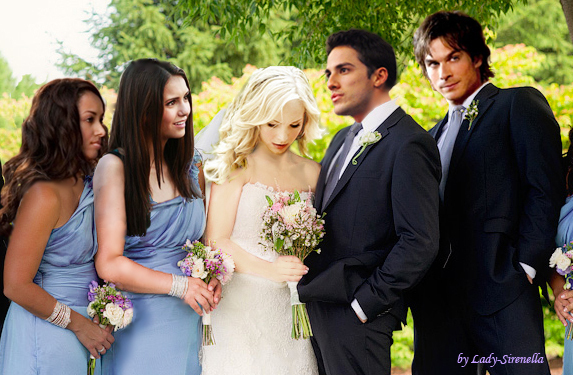 wedding 일 of Caroline and Tyler. . Wallpaper and background images in the 뱀파이어 다이어리 TV 드라마 club tagged: the vampire diaries ian somerhalder nina dobrev elena gilbert caroline forbes tyler lockwood bonnie bennett alaric satzman. This 뱀파이어 다이어리 TV 드라마 fan art contains 명예의 신부 들러리, 하녀, 신부 들러리, 하녀의 하녀, and 들러리.